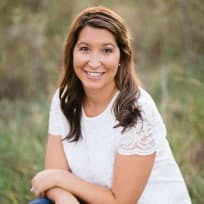 I'm so excited to share with you one of my favorite fall recipes that I've converted to an Instant Pot recipe! 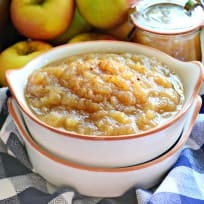 If you own an Instant Pot I think you'll love this easy recipe for Instant Pot Applesauce. It's made in under 20 minutes from start to finish and will leave your house smelling amazing. 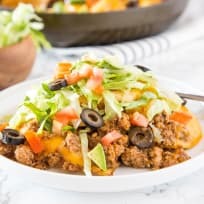 It's the perfect allergy-friendly recipe (see my notes below on this topic) and makes for a great snack, side dish, or even dessert. If you have excess apples and don't know what to do with them this is definitely one of the best ways to use them up. In my case, I had a dozen apples leftover from our Halloween party last month. My son insisted we bob for apples. We had at least 25 children at my house and I knew I needed a lot of apples, so I bought four dozen apples. I would rather have more then enough then not enough for all the kids to try and bob for an apple. The kids loved it and once everyone left and I saw that I had over a dozen apples left I knew homemade applesauce was in our future. 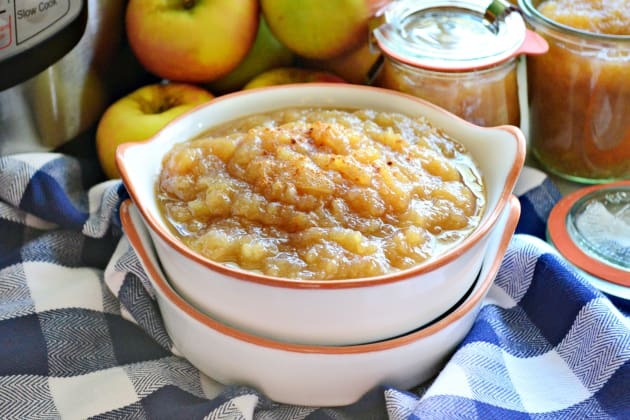 I have a stove-top recipe for homemade applesauce, but I knew I could make it in a fraction of the time in my Instant Pot. 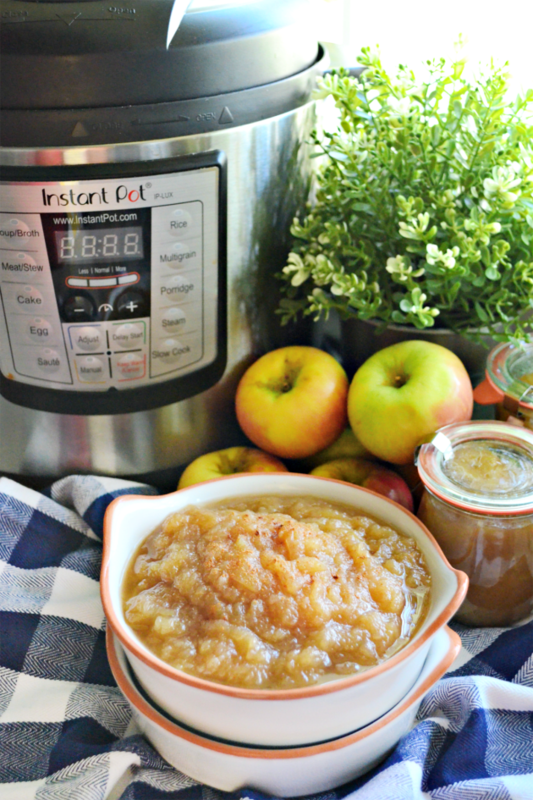 Using your Instant Pot to make applesauce is very easy. 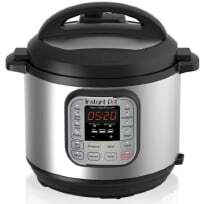 I use the "steam" setting in my electric pressure cooker for just 3 minutes. It will take about 3-5 minutes to come to pressure then an additional 3 minutes to cook. You can let the pressure cooker do a natural release or you can force pressure immediately. That takes about 1 minute of steam release. By the time you open the lid your apples will be soft and the perfect thick applesauce consistency. If you want smoother applesauce you can pressure cook for 4 minutes, and let the Instant Pot do a natural pressure release. You'll notice that my recipe for applesauce calls for a half cup of brown sugar plus apple cider. That is a lot of sugar. If you are trying to reduce the amount of sugar you consume you can make this applesauce without sugar. Just omit the brown sugar and sub out the apple cider for water. If you want to reduce some of the sugar you can use water instead of apple cider. I've cooked the applesauce with all three methods and each time it comes out perfect. It's all based on preference and dietary needs. 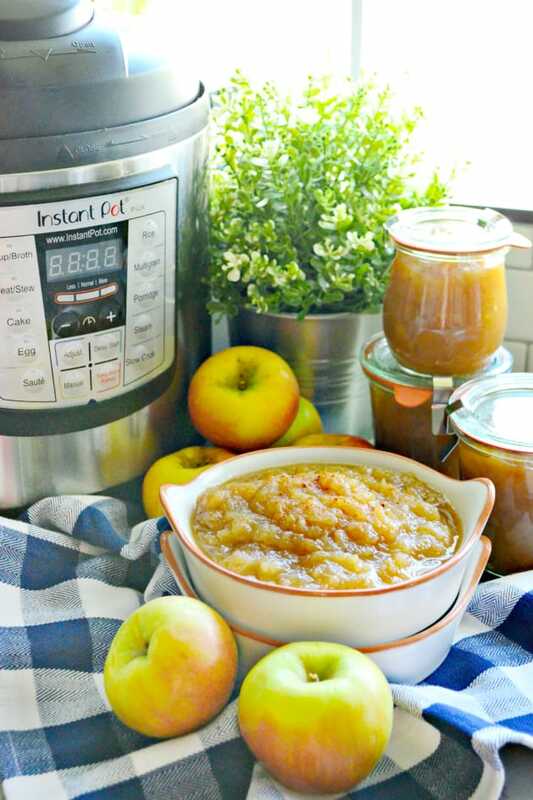 My recipe for Instant Pot applesauce is gluten free, dairy free and naturally vegan. 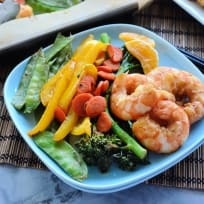 It's the perfect side dish for anyone with a gluten or dairy allergy. 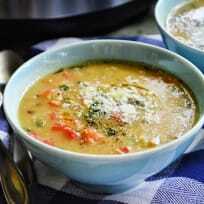 You could even serve this over gluten free oatmeal or as a dessert topping with a dairy-free ice cream. The sky is the limit. This recipe makes about 4 cups of applesauce. That may be a little too much for you to consume in a week’s time. That's when you can either can the applesauce for future use or my favorite (and easiest) method is to freeze applesauce. Let the applesauce completely cool and then divide among freezer bags. I like to use quart size freezer bags. I'll label and date and freeze laying flat for maximum space-saving storage! 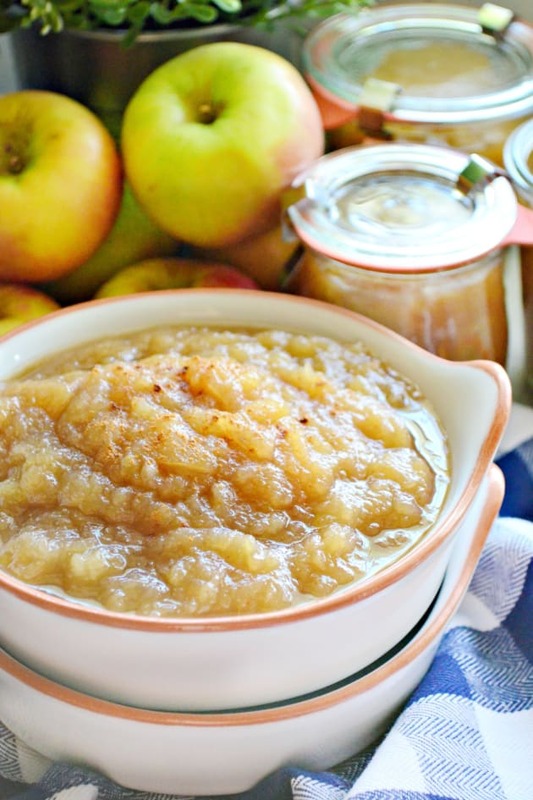 The homemade applesauce is good in the freezer for up to 3 months. To defrost, you place the freezer bag in the refrigerator and it will naturally thaw over a 24-hour period. Or for a quick defrost you run the freezer bag under cool water until thawed. You can reheat in a microwave or in a pot on the stove. Or eat it cold. The option is totally up to you. Peel, core, and chop apples into bite-size pieces. 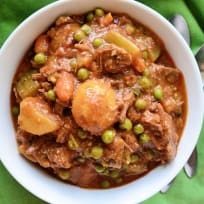 Place in the Instant Pot. Then sprinkle the brown sugar, cinnamon, and nutmeg on top of the apples. Pour the apple cider on top and stir the apples until all the sugar, cinnamon and nutmeg are combined. 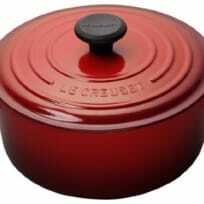 Place the lid on top of the Instant Pot, place valve in "sealing" position and select "steam" setting. Cook for 3 minutes. Once the applesauce is done, carefully force pressure from the Instant Pot until all the steam is removed. Open the lid and mix the apples. You'll notice it instantly looks like applesauce. If you don't want it as chunky just press some of the apples with the back of your spoon. 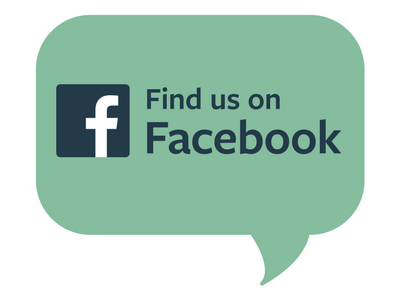 Eat warm, or let cool to room temperature the store in an airtight container in the refrigerator for up to 1 week. You can freeze the applesauce. Let the applesauce come to room temperature, then divide evenly among quart-size freezer bags. Make sure you label and date the bag, and lay flat in the freezer. The applesauce will be freezer-safe for up to 3 months.